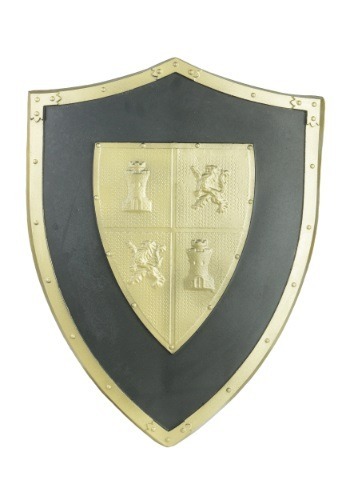 This shield is like the top level shield you can finally get in Zelda. This shield is the kind of shield Aragorn pulls out when we think all is lost. Not only does it block sword blows, it also redirects dragon fire, and arrows, and the dark magic of Saruman. This is the kind of shield that you would say wasn't just made, but forged. The gold edges made from the finest hair-spun gold only located in the hinterlands beyond the mountains. Starting to sound familiar? Good, because now this shield has chosen you. Sure, you might have preferred a sword. Most people do. But as they say, the best offense is a good defense. And this shield is the very best defense against all manner of dark enemies. So helm your shield, young squire, and hold it high. These times test the best of men, and you must persevere for the good of the realm! Onward!